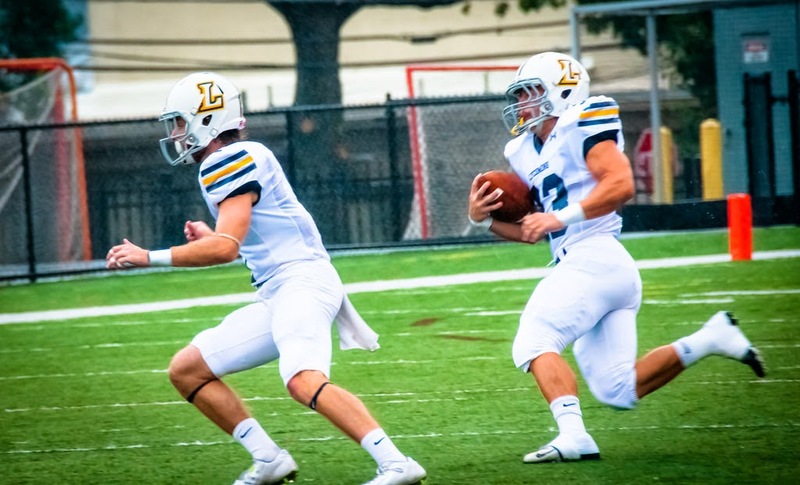 EDWARDSVILLE, Pa. – As the fourth quarter began, Wilkes made a stop on fourth-and-one to get the ball at the Lycoming 41 and they drove down to the 20-yard line, but a sack helped Lycoming get the ball back and a 78-yard drive later, the No. 22 Lycoming College football team withstand a threat from Wilkes University before posting a 27-14 Middle Atlantic Conference win at Ralston Field on a beautiful, Saturday, Sept. 26. With fourth-and-one at the 41, the Warriors (4-0 overall, 3-0 MAC) gave the ball to senior Craig Needhammer (Lansdale, Pa./North Penn) for the first play of the fourth quarter, but junior David Wilke broke through the line to make a stop behind the line, giving Wilkes the ball down 20-14. Five plays later, a nine-yard pass to William Deemer brought the ball to the 20-yard line, but a pass for no gain and an incomplete pass brought up third-and-10, where senior Jimmy Nottingham (Hightstown, N.J./Hightstown) sacked Wilkes’ quarterback Ryan Dailey. On fourth-and-12, an incomplete pass turned the ball over to the Warriors. Lycoming turned to its legs to move the ball down the field, with Needhammer posting a rush for 11 yards before senior quarterback Tyler Jenny (Glasgow, Pa./Glendale) ran for 19 yards to get the ball to the Wilkes’ 11-yard line. Two plays later, Needhammer crossed the goalline for his school-record 36thtime, surpassing the school record for touchdowns of 35 set by Tim Dumas (1996-99). After a four-play drive in which the Colonels went backwards three yards thanks to a 10-yard sack by junior Josh Cook (Hatfield, Pa./North Penn) on the first play of the drive, the Warriors ran the last 5:36 off the clock by running the ball eight straight times, ending the game at the Colonels’ four-yard line. The Warriors got on the board with the third drive of the game, driving 88 yards in eight plays, Jenny finding senior tight end Matt Cookson (Morrisville, Pa./Morrisville) for 33 yards on the first play of the drive before sophomore Blake Bowman (Valley View, Pa./Tri-Valley) took over, rushing for 19 and 17 yards to get it to the one-yard line before Jenny rushed in for six. Wilkes used a short field to tie the game with the first drive of the second quarter, as Dailey rushed in from 10 yards out to cap a 21-yard drive. After the teams traded turnovers, with junior Mike Gentile(Havertown, Pa./Haverford) picking a pass off in the end zone for the Warriors, the Warriors responded with a five-play, 80-yard drive to take the lead for good. Jenny capped the drive with a 39-yard touchdown strike to senior John Sibel (Yardley, Pa./Pennsbury). After driving Wilkes back eight yards on its next drive, Lycoming scored again on a nine-play, 62-yard drive, with Needhammer rushing for 22 yards to get it into Wilkes’ territory before senior Cam Kriner(Montgomery, Pa./Montgomery) caught a 19-yard pass to get the ball to the 11. Three plays later, Jenny found senior Tyler Botchie (Mechanicsburg, Pa./Mechanicsburg) for his first career touchdown from the three-yard line. After a missed extra point, the Warriors took a 20-7 lead into the locker room. Wilkes started the second half with a 67-yard drive, scoring on a five-yard rush from Dailey to make it 20-14, and Lycoming’s first three possessions of the second half lasted just nine plays total, but Wilkes was unable to make the Lycoming defense bend again. The Warriors rushed 45 times for 226 yards and two scores, led by 26 carries and 105 yards from Needhammer. Bowman rushed for a career-high 84 yards on 10 carries and Jenny added five carries for 28 yards and a score. Jenny was efficient passing as well, completing 14-of-23 passing for 183 yards and two touchdowns, but he was also intercepted for the first two times in his 2014 campaign. He threw to eight different receivers, with junior Corey Talerico (Moosic, Pa./Riverside) leading the team with four catches for 31 yards. 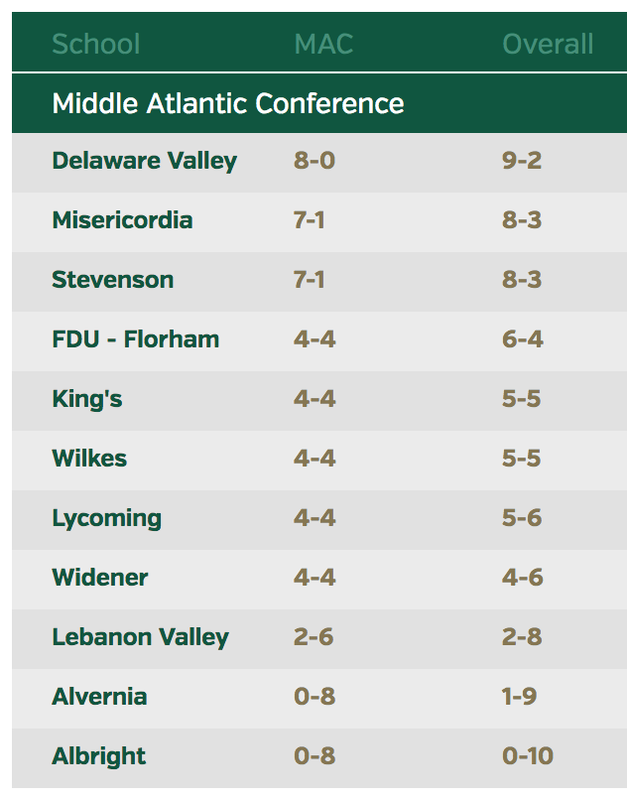 In all, the Warriors posted a season-high 409 yards of total offense and held the fast-paced Wilkes offense to just 230 yards. Dailey finished 14-of-30 for 114 yards passing and P.J. Incremona led the Wilkes rushing attack with eight carries for 30 yards. Deemer led the receivers with four catches for 32 yards. Junior Brian Campbell (Drums, Pa./Hazleton Area) led the Warriors defensively, as he notched 11 stops and senior Kyle Sullivan (Coatesville, Pa./Bishop Shanahan) notched eight stops. Junior Cole Welham(Lewistown, Pa./Lewistown Area) notched five stops and a sack and Gentile posted five stops, an interception and three breakups. Cook added two tackles for loss and a sack, one of four for the Warriors. Tanner Stengel led the Colonels with 10 tackles and Jared Powell added eight stops, a forced fumble and an interception. Jon Koslop posted five tackles and a sack. The Warriors get back on the field on Saturday, Oct. 4, when they face undefeated Stevenson in another MAC showdown at David Person Field. Kick-off is set for 1 p.m.